The colleagues over at Tom's Guide were able to get their hands on the new iPhone XS and XS Max and put them both through extensive testing. They even put Apple's new flagships against Android's current best smartphones sporting Snapdragon 845 chipsets and last year's iPhone X. 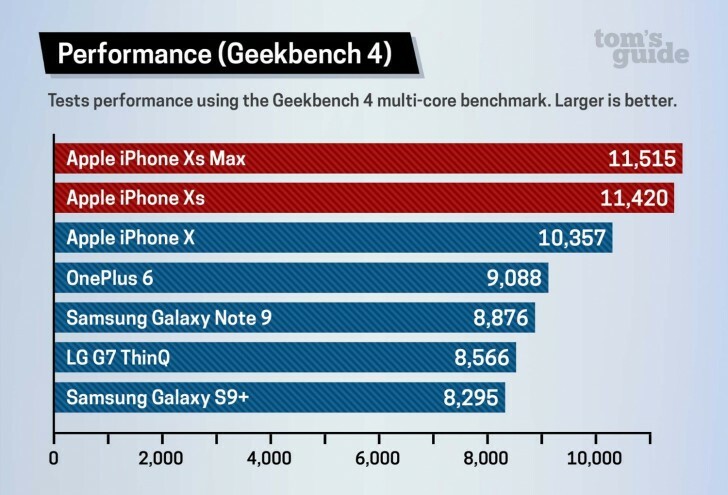 As expected, multi-core performance isn't a big leap over the A11 Bionic from 2017 but single core performance is vastly improved. And when put against Android's current flagships, it's a clean sweep for the A12. The available synthetic benchmarks are Geekbench 4, 3DMark Slingshot Extreme and GFXBench 5.0/Metal. The new iPhones take the lead in most of them, closely followed by last year's iPhone X. However, according to the 3DMark Slingshot Extreme, which is a graphics-intensive test, the OnePlus 6 takes the lead with the Galaxy Note9 and the Galaxy S9+ behind. The other GPU test - GFXBench 5.0 Aztec Ruins gives the 2018 iPhones a comfortable lead. We aren't short of real-world performance tests either. The handsets have been tested with video editing, which is transcoding 2-minute 4K clip to 1080p, and demanding app open times. The iPhones aced the tests crushing the Android competition, especially in the video editing test. And given that the Android phones are plenty fast already, this clearly shows that the A12 Bionic chip is a real beast of a chipset.